"This sweet and creamy martini is rich enough to be considered a dessert." Pour the chocolate liqueur, creme de cacao, vodka, and creamer into a cocktail shaker over ice. Cover, and shake until the outside of the shaker has frosted. 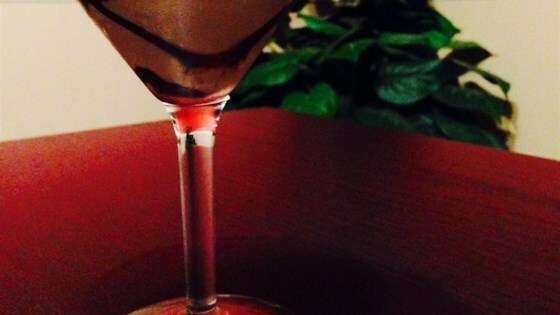 Dip the rim of a chilled martini glass in chocolate syrup. Strain the cocktail into the glass to serve. Oh ya, keep 'em comin'. The only change I made was to use light cream instead of the non-dairy creamer because I like to use natural products. yummo. Loved this. I used Godiva Chocolate Liquor which is fabulous and cut the creamer with milk b/c i thought it was too sweet. So good though. Thank you to Nikki! Delicious !! Did use the carmel vanilla creamer as recommended and just drizzled the syrup in the glass before adding the martini !